Modellverisum has a review of the double-boxed Hase MiG-21F & MiG-17. Both kits are fairly old, being original moulds, but that have provided three decal options for each. Obviously the Revell Fishbed would be better served, although we're yet to see a decent Fresco. From an accuracy point of view, Hase Fishbed is pure crap, even Airfix one is much better. About Fresco, I think it is out of scale, oversized, but I will check. The other contender would be KP that is much worse in details, but I think is more accurate. If you want a decent Fresco, try Bilek (not easy to find) or Dragon. And now, M'Lud, a few words from the Defence. I have a soft spot for these kits and have bought two of this double kit release. Another reason that I like the MiG-21 is that, because it's overscale (like its Academy clone), the wings are useful if you want to scratchbuild the MiG-23-01 Faithless or the MiG-23M project or one of the MiG-21 projects that had larger wings, or just for whiffing generally. I'm also thinking of using parts of the fuselage for the Ye-50 series of mixed power fighters. The MiG-17 is not bad either. Set against the plans that I have, its two main problems are that the wing span is too great and the fin is too large. The wing can be fixed by removing a section from the parallel chord section between the two inner wing fences and cutting down the fin shouldn't be a big problem. I've never bothered to do this with the ones that I've built but (my personal opinion only) I think that, even with its flaws, the Hasegawa kit looks much better than the KP kit which seems to have a narrow, cartoonish wing or the Bilek/Dragon kit which just seems too delicate. Again, this release of a very old kit has very little flash, fits together well and has interesting decals. Radish - I agree about the Revell MiG-21 but I thought that the Hobby Boss MiG-17 was going to be 1/48? Hase have also released the Tiger and Cougar togeather as a double kit. I know! I brought one at the weekend. I agree about the Revell kit of the MiG, BUT, it is an early version. I was hoping that revell would mould some of the later versions as well. Purely a personal opinion, but I prefer the later models. Then ... Fujimi is the answer: superb and not expensive. We seem to have wandered away from the original Hasegawa topic, but I completely agree about the Fujimi kit. The Zvezda "PFM" and "bis" are good if you can find them but the Fujimi model is my favourite MiG-21 kit. Oddly, you don't have to look far on the internet to find people rubbishing it and a slightly obsessive Finn once told me that he had compared the "Black Lynx" boxing to the real thing and that all the panel lines on the kit were wrong! While it certainly has its problems - the fuselage is too chunky, the fuselage bulges above the wheel wells are offset forward, and all the "MF" versions actually have the larger "bis" spine, it is a real pleasure to build and the flaws aren't noticeable when it's built - look at AD's ETPS version in the one week GB. Hannants have a 1/72nd MiG-17PF listed from HobbyBoss in Future Releases. I've a couple on order. I agree re: the Hasegawa MiG-17PF....I've built a few in the past and it's a nice looking model. The spines did get changed on some Mig-21s at unit level. The SMK was the main one when they realised the CoG was truely screwed with the extra tankage in the "Humpback". IIRC they got fitted with "M" and "MF" spines. So it's possible that other subseries got them changed during overhaul? Hasegawa # 00921, 1/72nd scale Lockheed S-3A Viking. While this is an older kit it is worth checking to see the images of the kit contents. Markings provided in the kit for one aircraft, Bu-No 9391 with normal squadron markings in 1975 and the special 1976 Bicentennial paint scheme. 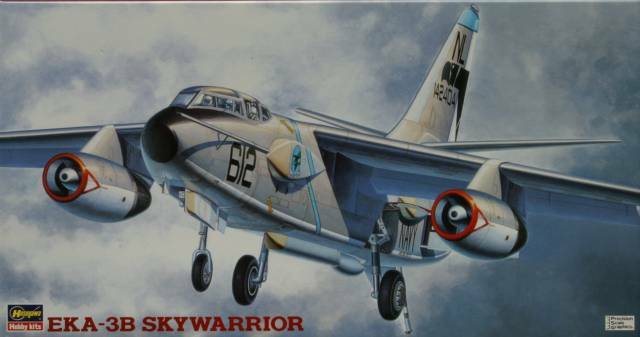 Hasegawa # 00924, 1/72nd scale Lockheed EKA-3B Skywarrior. Looks like the kit gains some anti-aircraft rockets as well as the Jet parts. Has optional Luftwaffe markings for Heinz Bar's Red 13. Whif-tastic model.